The Spider-Armor Mark IV is Peter Parker's most powerful and technologically advanced costume to date. Developed by Spider-Man at Parker Industries this new spider-suit is made of lightweight, metallic liquid nano-technology, making it bullet-proof, can deflect lasers at close range, and can absorb the impact of falling several stories, leaving whoever is in the suit unharmed. The suit is also heat resistance to the point where Spider-Man can battle the Human Torch without fear of injury! 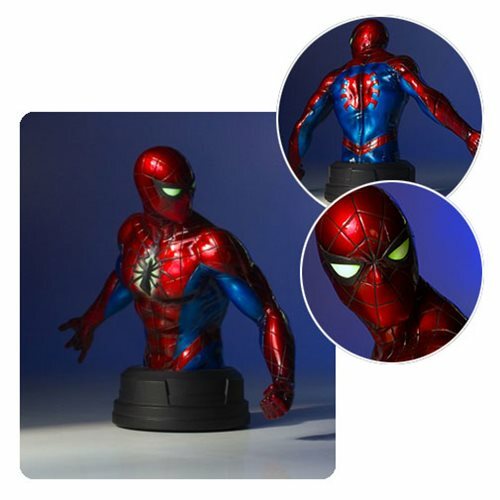 Digitally sculpted by the master artisans at Gentle Giant Ltd., Spider-man Mark IV Suit mini bust features a metallic paint job with eyes and a spider emblem that seem to glow. Crafted using only the highest quality polystone, each limited-edition hand-painted mini bust comes individually numbered and is packed with a matching certificate of authenticity. 1:6 scale bust measures about 6-inches tall.